A fantastic weekly food and wine market showcasing Wellington artisans. 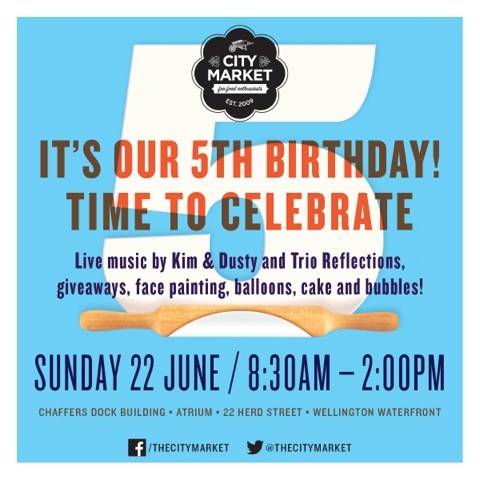 Tucked inside the atrium of the iconic Chaffers Dock Building on Wellington’s waterfront, the City Market is the capital’s number one destination for a taste of the region. Championed by award-winning chef Martin Bosley and Rachel Taulelei of local food company Yellow Brick Road, the City Market brings a star-studded line-up of local food and beverage producers together under one roof. Each week sees new restaurant in the Market Kitchen, fabulous wine, cider and craft beer tastings, event previews, book signings, chef demonstrations and cooking classes in the Gaggenau Kitchen, and entertainment. The Wandering Palate will also be there, having recently relocated to my hometown, and living in the very same building!